Set in Liverpool, 007 HOUSE BOAT is 600 metres from ACC Liverpool. There is a restaurant and bar and guests can have fun at the water park. The property hosts live entertainment and quizzes throughout the week and weekend. Liverpool Echo Arena is 700 metres from the property. Free WiFi is provided. Guests will have full private use of the 007 HOUSE BOAT, featuring a seating area with a 65-inch satellite flat-screen TV and iPod docking station. Included is a dining area and/or patio. There is also a kitchen, fitted with an oven, a microwave, a toaster, a fridge, a kettle and a dishwasher. There Towels and bed linen are featured. Guests can enjoy the on-site restaurant. Guests will also find memorabilia from the James Bond films. You can play darts at the property, and the area is popular for skiing. Situated just 5 miles from Liverpool city centre with a direct bus service 100 metres from the property, 2 Therocklands is a 4-star property set on the edge of 90 acres of woodland, and offers free Wi-Fi and free on-site parking. Situated just 5 miles from Liverpool city centre, 2 Therocklands is a 4-star property set on the edge of 90 acres of woodland, and offers free Wi-Fi and free on-site parking. A flat-screen TV and tea/coffee making facilities are featured in each room at Therocklands, as well as views onto the property garden. Breakfast is cooked to order, and includes fresh fruit and cereal. Transport from airports and rail stations can be arranged, as well as Beatle tours. Everton and Liverpool FC tours are available, and Royal Liverpool Golf Club is 15 minutes away. The Roman city of Chester is 30 minutes away. Featuring a shared lounge, 57 Rodney Street is situated in Liverpool, 400 metres from Philharmonic Hall. With free WiFi, this 3-star guest house offers a shared kitchen. Liverpool Metropolitan Cathedral is less than 1 km from the property. At the guest house, the rooms are equipped with a wardrobe. Selected rooms have a kitchenette with a microwave, a toaster and a fridge. The units at 57 Rodney Street are fitted with a seating area. Williamson's Tunnels is a 17-minute walk from the accommodation, while Liverpool ONE is 1.8 km away. The nearest airport is Liverpool John Lennon Airport, 13 km from the property. Set in Liverpool, 400 metres from Anfield Stadium, 88 Anfield Road provides free WiFi. A continental breakfast can be enjoyed at the property. Royal Court Theatre is 3.7 km from the bed and breakfast. The nearest airport is Liverpool John Lennon Airport, 17 km from 88 Anfield Road. Located within 700 metres of Williamson's Tunnels and 1.3 km of Liverpool Metropolitan Cathedral, Ahmed House offers rooms in Liverpool. Featuring a garden, the property is located within 1.9 km of Philharmonic Hall. Royal Court Theatre is 2.9 km from the guest house and Sefton Park is 3.2 km away. All rooms in the guest house are equipped with a flat-screen TV. The private bathroom is fitted with a bath. Liverpool ONE is 3.3 km from Ahmed House, while Western Approaches Museum is 3.4 km away. The nearest airport is Liverpool John Lennon Airport, 12 km from the accommodation. Ampthill Studios provides accommodation in Liverpool. Located around 3.6 km from Sefton Park, the guest house with free WiFi is also 5 km away from Philharmonic Hall. Local points of interest like ACC Liverpool and Liverpool Echo Arena are reachable within 5 km and 5 km, respectively. All guest rooms in the guest house are fitted with a kettle. Each room is fitted with a private bathroom. The units have a wardrobe. Liverpool Metropolitan Cathedral is 5 km from Ampthill Studios. The nearest airport is Liverpool John Lennon Airport, 10 km from the property. The rooms are fitted with a flat-screen TV. There is a shared lounge, and you can play darts on site. A bus stop with direct links to the city centre and waterfront is directly opposite Anfield Accommodation. Set in Liverpool, near Sefton Park, Barrington House features free WiFi, and guests can enjoy a terrace and a shared lounge. A continental breakfast can be enjoyed at the property. Mendips John Lennon Home is 2.5 km from the bed and breakfast. Liverpool John Lennon Airport is 9 km away. Beech Mount Grove Suites are set in a leafy suburb of Liverpool situated in close proximity to Sefton Park and the bohemian quarter of lark lane where there is an abundant of superb restaurants, Excellent bars and pubs are all within walking distance, as is the world famous Penny Lane, home of The Beatles.Good transport links to the city centre. In a quiet Liverpool suburb near Sefton Park, Beech Mount Grove Suites offers kitchen facilities, free Wi-Fi and free parking. Beech Mount is south-east of Liverpool city centre and buses to the city stop close by. Lime Street Train Station and Liverpool One shopping centre are 10 minutes' drive away. Each suite is spacious, well furnished and has Freeview TV, a fridge and modern en suite bathroom. Featuring a garden, Bentley Studios is set in Liverpool, 1.4 km from Sefton Park. Around 2 km from Philharmonic Hall, the property is also 2.6 km away from Liverpool Metropolitan Cathedral and offers free WiFi. The property is situated 2.9 km from Williamson's Tunnels. Selected rooms are equipped with a kitchen with an oven. ACC Liverpool is 3.2 km from the guest house, while Liverpool Echo Arena is 3.2 km from the property. Liverpool John Lennon Airport is 11 km away. Black Lions Guest house is privately owned and ideally situated in the heart of the busiest industrial and commercial area in the North West ? Wirral Liverpool Chester & North Wales. Offering a terrace and views of the garden, Black Lions Guest House is situated in Birkenhead in the Merseyside Region, 4.7 miles from Liverpool. Free WiFi is provided throughout the property and free private parking is available on site. The rooms include a TV. There is a shared lounge at the property. Chester is 21 km from Black Lions Guest House, while Southport is 31 km from the property. Liverpool John Lennon Airport is 15 miles away. Blue Wheel Cottage offers accommodation on the Wirral Peninsula, 5 miles from Liverpool and 3.2 miles from Stena Line Ferries. Liverpool city centre is just 15 minutes away by bus, which stops at a bus stop just a 1-minute walk from Blue Wheel Cottage. All rooms have a flat-screen TV. Each room has its own tea, coffee and hot chocolate making facilities. All toiletries are provided. The property is 1 mile from Tranmere Rovers Football Club and within 15 minutes from Echo Arena. Liverpool John Lennon Airport is 14.3 miles away and Manchester Airport is 43.8 miles away. M53 is located less than 1.5 km from the property. Located in Bootle, The Park Hotel is in the business district and close to Aintree Racecourse and Antony Gormley's Another Place. Located just 1 mile from Aintree Racecourse and 5 miles from LFC, The Park Hotel is ideally located for all the major road networks. All bedrooms are en-suite, offering free WiFi and Freeview channels along with a complimentary hospitality tray. The Aintree Restaurant and patio serves evening meals, and special offer 3-course dinners. A selection of carefully chosen beers, wines and spirits can be enjoyed in The Grand National Bar. The convenient location means that the hotel offers easy access to the region's main roads and motorways, with Switch Island road junction just 800 metres away. Free private parking is available on site for residents and those attending one of the properties' 6 meeting/function rooms. Situated within a 5-minute walk of Royal Court Theatre, Brownlows Inn is situated above a pub. Ideally located in the Liverpool City Centre district, this hotel is set a 10-minute walk from Liverpool ONE. The property is 400 metres from the city heart and 1.1 km from Albert Dock. All rooms in the hotel are fitted with a kettle. The private bathroom is equipped with a shower and free toiletries. Around the clock assistance is available at the reception. Pier Head is 1.1 km from Brownlows Inn. Liverpool John Lennon Airport is 11 km from the property. Set in Liverpool, Cargo Cafe Apartments has accommodation 2.7 km from 20 Forthlin Road. Set in Liverpool, Cargo Cafe Apartments has accommodation 6 km from Sefton Park. Free WiFi is offered. A Full English/Irish breakfast is served every morning at the property. The on-site restaurant serves British cuisine. Guests can also relax in the shared lounge area. Philharmonic Hall is 8 km from the bed and breakfast. Liverpool John Lennon Airport is 4.4 km from the property. Less than 3 miles from the centre of Liverpool, 10 minutes' drive from Albert Dock, Castle Lodge Guest House has free Wi-Fi and free CCTV monitored parking, plus a lift and wheelchair access via a ramp. Less than 3 miles from the centre of Liverpool, 10 minutes' drive from Albert Dock, Castle Lodge Guest House has free Wi-Fi and free CCTV monitored parking, plus a lift and wheelchair access via a ramp. In the morning, breakfast consists of a choice of cereals, yogurt, fresh fruit, toast, jam, tea and coffee. Each room offers a Freeview TV, ironing facilities, and a hairdryer. The rooms benefit from either private en suite bathrooms or shared bathroom facilities. Some spacious rooms can sleep up to 6 persons, ideal for groups. The M62 motorway is less than 10 minutes from Castle Lodge by car. The Anfield Football Stadium is just a 10-minute walk or a 2-minute drive away. Liverpool One Shopping Centre and Tate Liverpool are about 15 minutes' drive away. Located in Liverpool, Chateau julie provides accommodation with free WiFi. A buffet breakfast is available daily at the bed and breakfast. Guests can also relax in the garden. Casbah Coffee Club is 3.6 km from Chateau julie, while Anfield Stadium is 7 km away. Liverpool John Lennon Airport is 17 km from the property. Located just 4 miles from Liverpool city centre and 5 minutes from the M62 motorway, Childwall Abbey Hotel is within easy reach of the many attractions of the European Capital of Culture 2008. Just 4 minutes' drive from Broad Green Train Station, Childwall Abbey by Marstons Inns offers attractive en suite accommodation around 5 miles outside Liverpool. It has a bar and restaurant, free parking and Wi-Fi. Each guest room at Childwall Abbey has en suite bathroom facilities with shower or bath. There is a TV and bottled water in all rooms at Childwall Abbey, which is thought to date back several hundred years. A freshly cooked breakfast is served each morning. The pub serves a full menu including steaks, gourmet burgers, sharing platters, pasta and a wide choice of desserts. Five minutes from the M62, this hotel is around 3 miles from Huyton. Widnes and St Helens are both within a 20-minute drive. Located in Wirral, Church Street Rooms provides a garden. Free WiFi is available. All guest rooms in the guest house are equipped with a kettle. Liverpool is 5 km from Church Street Rooms, while Chester is 26 km away. The nearest airport is Liverpool John Lennon Airport, 18 km from the property. City B and B is set in an industrial part of Liverpool in a dockside location, 1 mile from the city centre. In a dockside location, City B and B is located above a small, award-winning caf�, the Waterloo Diner. Liverpool city centre is within a 5-minute drive. Free on-street parking and free Wi-Fi are available. Housed over 3 floors, the family-run City B&B has basic rooms with a bed only, and towels available to hire. A continental breakfast is served in the O'Toole's Guest House for additional charge. O'Toole's Guest House is 2-minute walk away, where guests check in. Tourist attractions such as Albert Dock, Beatles Story, Liverpool One and City Tour are a 5-minute drive from The City B and B. Set in Liverpool, 87 Wood Street Apart Hotel is 600 metres from Royal Court Theatre. Set in Liverpool, within 2 km of Sefton Park and 2.9 km of Philharmonic Hall, Colebrooke House offers free WiFi. The property is located 3.5 km from ACC Liverpool, 3.5 km from Liverpool Echo Arena and 3.5 km from Liverpool Metropolitan Cathedral. Williamson's Tunnels is 3.8 km away and Liverpool ONE is 3.9 km from the guest house. The guest house offers a terrace. Albert Dock is 3.9 km from Colebrooke House, while M&S Bank Arena Liverpool is 4.1 km away. The nearest airport is Liverpool John Lennon Airport, 10 km from the accommodation. Situated in Liverpool within 300 metres of Anfield Stadium and 3.9 km of Williamson's Tunnels, Crew Rooms Anfield provides rooms with free WiFi. All rooms boast a kitchen and a shared bathroom. Casbah Coffee Club is 4.1 km away and Liverpool Metropolitan Cathedral is 4.1 km from the guest house. All rooms in the guest house are fitted with a coffee machine. The units include a desk. Cycling is among the activities that guests can enjoy near Crew Rooms Anfield. Royal Court Theatre is 4.2 km from the accommodation, while Western Approaches Museum is 5 km away. The nearest airport is Liverpool John Lennon Airport, 17 km from Crew Rooms Anfield. Set in Liverpool, Crew rooms Liverpool features a garden and free WiFi. The property is around 1.3 km from Anfield Stadium and 3 km from Casbah Coffee Club. Local points of interest like Williamson's Tunnels and Liverpool Metropolitan Cathedral are reachable within 3.9 km and 4.2 km, respectively. Philharmonic Hall is 5 km from the guest house. The nearest airport is Liverpool John Lennon Airport, 15 km from the property. Set in the Royal Albert Dock in central Liverpool, just 700 metres from Liverpool Echo Arena, Djinn Palace provides accommodation with free WiFi. The boat is 700 metres from ACC Liverpool and 700 metres from Liverpool ONE. This boat features 2 bedrooms, a flat-screen TV, and a kitchenette with a microwave and a toaster. The boat also offers 1 bathroom with a shower. Liverpool John Lennon Airport is 13 km from the property. Boasting a casino, Double Room near City Centre/Anfield Stadium is located in Liverpool, less than 1 km from Anfield Stadium. The property is set 3.1 km from Williamson's Tunnels. The property is situated 3.4 km from Liverpool Metropolitan Cathedral and 4 km from Philharmonic Hall. All rooms at the guest house are equipped with a seating area. Rooms are equipped with a shared bathroom. All units will provide guests with a desk and a coffee machine. The area is popular for cycling, and bike hire is available at Double Room near City Centre/Anfield Stadium. Royal Court Theatre is 4 km from the accommodation. Liverpool John Lennon Airport is 16 km from the property. Elegant House offers accommodation 1 mile from the city centre and less than 2 miles from the riverfront. The property is a short walk from the fashionable Baltic Triangle and the Lark Lane food and drink destination. The property has rooms with garden views, free Wi-Fi and free parking. Breakfast is served in the dining room, with an open fire place. There is a choice of cereals, fruit, yoghurt, cheeses, salmon, cold meats, tea and coffee. Vegan, vegetarian and gluten free options can easily be provided with one day's notice. Each room includes a hairdryer, dressing gown and toiletries. In-room tea and coffee making facilities are available on request. Rooms have either an en suite bathroom or an external private bathroom. Liverpool city centre can be reached within 9-minutes via public transport. Located in the popular L1 district of Liverpool city centre, Epic Serviced Apartments offer luxury, elegant apartments with free WiFi and direct access to shops and restaurants. Each apartment is uniquely decorated and each has a modern kitchen with a stylish breakfast/dining area. Linen and towels are included and other amenities include a hairdryer and ironing facilities. Albert Dock is a 10-minute walk from Epic Serviced Apartments and the Anfield Stadium, home of Liverpool Football Club, can be found a 20-minute drive away. Located 1.1 km from Sefton Park, Franks Serviced Accommodation in Liverpool offers a bar. The property is around 2.3 km from Mendips John Lennon Home, 3.3 km from Williamson's Tunnels and 3.3 km from Philharmonic Hall. Free WiFi is included. The units in the guest house are fitted with a kettle. Selected rooms also feature a kitchen with an oven and a microwave. All guest rooms include a shared bathroom. Liverpool Metropolitan Cathedral is 3.6 km from Franks Serviced Accommodation, while 20 Forthlin Road is 4.2 km from the property. Liverpool John Lennon Airport is 9 km away. Ground Floor En-Suites is offering accommodation in Birkenhead. Among the various facilities of this property are a garden and a shared lounge. Both free WiFi and private parking are accessible at the guest house. The rooms at Ground Floor En-Suites are equipped with a seating area. The rooms are equipped with a private bathroom with a bath, while certain rooms are fitted with a kitchen with an oven. The units feature a desk. Liverpool is 8 km from the accommodation, while Chester is 27 km from the property. Liverpool John Lennon Airport is 22 km away. Located in Liverpool, Hotel Tia features a garden and a shared lounge. All rooms boast a flat-screen TV with satellite channels and a private bathroom. The property is set 300 metres from Anfield Stadium and 3.8 km from Royal Court Theatre. Guest rooms in the hotel are fitted with a kettle. A continental breakfast is available every morning at Hotel Tia. The accommodation offers a sun terrace. The reception can provide advice on the area in order to help guests plan their day. Williamson's Tunnels is 4.1 km from Hotel Tia, while Western Approaches Museum is 4.2 km from the property. The nearest airport is Liverpool John Lennon Airport, 17 km from the hotel. Situated in Liverpool in the Merseyside region, with Williamson's Tunnels nearby, I LIV APARTHOTEL features accommodation with free WiFi. All units come with a living room, a seating area, a flat-screen TV with cable channels, a fully equipped kitchen with a dining table and a private bathroom with shower. An oven and microwave are also available, as well as a kettle. Guests can also relax in the garden. Liverpool Metropolitan Cathedral is less than 1 km from the aparthotel. The nearest airport is Liverpool John Lennon Airport, 12 km from I LIV APARTHOTEL. Located in Liverpool, less than 1 km from Sefton Park, Lancaster House provides express check-in and check-out and free WiFi. Situated conveniently in the Sefton Park district, the property is set 2.7 km from Philharmonic Hall and 3.1 km from Mendips John Lennon Home. The property is situated 3.4 km from Liverpool Metropolitan Cathedral. The rooms in the guest house are fitted with a kettle. The rooms are equipped with a shared bathroom. The units will provide guests with an oven. Williamson's Tunnels is 3.6 km from Lancaster House, while ACC Liverpool is 4 km from the property. Liverpool John Lennon Airport is 10 km away. Featuring free WiFi, Leigh Arms Accommodation is located in Liverpool, 1.2 km from Anfield Stadium. A flat-screen TV is available. There is a shared kitchen at the property. Goodison Park, home of Everton Football Club is 700 m from the property. Royal Court Theatre is 3.4 km from Leigh Arms Accommodation, while Pier Head is 3.9 km from the property. The nearest airport is Liverpool John Lennon Airport, 14 km from Leigh Arms Accommodation. Situated in Liverpool, 1.9 km from Liverpool Metropolitan Cathedral, Liverpool Lodge has rooms with free WiFi access. Providing a shared lounge, the property is located within 2.5 km of Philharmonic Hall. Royal Court Theatre is 2.8 km from the guest house and Anfield Stadium is 3 km away. The units in the guest house are fitted with a TV with satellite channels. Guests at Liverpool Lodge can enjoy a continental breakfast. The accommodation offers a sun terrace. Pier Head is 3.4 km from Liverpool Lodge, while The Cavern Quarter is 3.5 km from the property. The nearest airport is Liverpool John Lennon Airport, 14 km from the property. Located in Liverpool, 9 km from Anfield Stadium, Luxury Historic House offers accommodation with free WiFi and free bikes. A continental breakfast is served each morning at the property. The bed and breakfast offers a barbecue. A garden and a terrace are offered at the property. Western Approaches Museum is 9 km from Luxury Historic House, while Pier Head is 9 km from the property. The nearest airport is Liverpool John Lennon Airport, 24 km from the property. Located in Wirral, Manor Garden Lodge features a garden with a terrace, and offers rooms with private bathroom and free WiFi access. The bed and breakfast provides guests with on-site private parking free of charge. Rooms at Manor Garden Lodge have garden views and come with flat-screen satellite TV and tea and coffee making facilities. They all include a private bathroom fitted with a bathtub or a shower and a hairdryer. A wholesome breakfast is served every morning in the common breakfast room or in the guest rooms. Liverpool is 9 km away and features a wide array of caf�s, supermarkets and restaurants serving regional cuisine and international specialities. Guests can enjoy hiking and Nordic walking in the Snowdonia National Park's greenery, located 60 km from Manor Garden Lodge. Manchester is 50 km from the bed and breakfast. Set in Liverpool and within 500 metres of Anfield Stadium, Masters Guest house features a garden, non-smoking rooms, and free WiFi. The property is located 3.9 km from Williamson's Tunnels and 4 km from Royal Court Theatre. The property is situated 4.2 km from Liverpool Metropolitan Cathedral. Guest rooms at the guest house are fitted with a seating area and a flat-screen TV. Each room is fitted with a private bathroom with a bath. All units will provide guests with a toaster. Western Approaches Museum is 5 km from Masters Guest house. The nearest airport is Liverpool John Lennon Airport, 17 km from the property. O?Toole?s guest house is located at the corner of Dublin Street and Regent Road next to the old Heritage Market. If you are using sattelite navigation please use Dublin Street as your destination. Free wifi available towels available for hire. O'Toole's is a pet friendly guest house. OTooles rooms are all en-suite with TV and tea and coffee facilities. Check in for City BnB is at OTooles guest house. City BnB is above the Waterloo Diner a small transport cafe. City BnB rooms are all shared bathrooms 1 bathroom between 3 rooms 3 bathrooms in total these rooms are bed only towels available to hire . Liverpool is more than just a city with a big reputation - It's the centre of beauty culture and entertainment that should be explored. Palatine Hotel is a 10-minute drive from Mendips, the childhood home of John Lennon which is open to the public. Palatine Hotel is a 10-minute drive from Mendips, the childhood home of John Lennon which is open to the public. Liverpool South Parkway railway station is a 5-minute walk and has trains to Liverpool Central which take 15 minutes. An LCD flat-screen TV with cable channels is provided with all rooms at The Palatine, as well as use of a shared bathroom. The use of shared kitchen facilities are available and The Palatine pub serves a wide range of beers, wines and spirits. Buses to Liverpool John Lennon Airport run from Liverpool South Parkway railway station and there are 5 every hour. Anfield and Goodison Park football stadiums are only a 20-minute drive from the hotel. Pinnacle house is located in Liverpool, 2.2 km from Williamson's Tunnels, and offers free WiFi. Located around 2.4 km from Anfield Stadium, the guest house is also 2.5 km away from Liverpool Metropolitan Cathedral. Attractions in the area include Philharmonic Hall, 3 km away, or Royal Court Theatre, set 3.3 km from the property. All units in the guest house are fitted with a flat-screen TV. All rooms have a seating area. A continental breakfast is served daily at the property. Western Approaches Museum is 3.9 km from Pinnacle house, while The Cavern Quarter is 4.1 km away. The nearest airport is Liverpool John Lennon Airport, 14 km from the accommodation. Podzzz offer inventive, futuristic accommodation within Liverpool's Parr Street Studios, with its award-winning bar and recording studio. Podzzz offer inventive, futuristic accommodation within Liverpool's Parr Street Studios, with its award-winning bar and recording studio. Compact and stylish, each pod features an LED TV. Guests can enjoy a drink in the chic lounge bar at Parr Street Studios, with its leather sofas, pastel colours, and classic stone walls. Each colourful pod is fully soundproofed and comes with free WiFi access and tea/coffee facilities. Home to 3 of Coldplay's albums, the studios also provide regular, live shows and club nights. Liverpool's vibrant centre is just 15 minutes' walk away, and Liverpool ONE shopping centre is a 5-minute walk. Liverpool Lime Street Rail Station is a 10-minute walk, and The Beatles Story attraction is 15 minutes' walk. Situated in Birkenhead, R.L.E 26 provides free WiFi. All units in the guest house are equipped with a kettle. All rooms have a shared bathroom. All guest rooms in R.L.E 26 are fitted with a flat-screen TV and a hair dryer. Liverpool is 7 km from the accommodation, while Chester is 24 km away. Liverpool John Lennon Airport is 22 km from the property. Set in Birkenhead, R.L.E 93 features free WiFi. All units in the guest house have an electric kettle, a fridge, complimentary tea, coffee and bottled water. A flat-screen TV is also provided in each room. 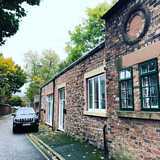 A washing machine is offered and a hairdryer, iron, and ironing board are available upon request Liverpool is 7 km from R.L.E 93, while Chester is 23 km from the property. Liverpool John Lennon Airport is 21 km away. Renshaw Guest House is situated in Liverpool, within 600 metres of Philharmonic Hall and less than 1 km of Liverpool Metropolitan Cathedral. Built in 2014, the property is within a 17-minute walk of Williamson's Tunnels. Free WiFi and a shared kitchen are available. At the guest house, all rooms are fitted with a desk. Rooms have a private bathroom with a shower and free toiletries. The rooms at Renshaw Guest House come with a seating area. Liverpool ONE is 1.7 km from the accommodation. The nearest airport is Liverpool John Lennon Airport, 12 km from the property. Located in Liverpool, Rooms @ 29 features free WiFi, 2 km from Anfield Stadium and 4.4 km from Royal Court Theatre. Williamson's Tunnels is 5 km from the bed and breakfast. The nearest airport is Liverpool John Lennon Airport, 17 km from the property. Set in the Liverpool City Centre of Liverpool, Rooms in Liverpool's Georgian Quarter is 700 metres from Philharmonic Hall. The property is located less than 1 km from Williamson's Tunnels and a 13-minute walk from Liverpool Metropolitan Cathedral. 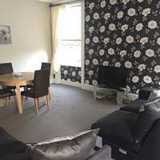 The property is situated in the Liverpool City Centre district, 2.6 km from ACC Liverpool. The rooms at the guest house come with a seating area and a flat-screen TV with cable channels. With a shared bathroom, rooms at Rooms in Liverpool's Georgian Quarter also have free WiFi. Guest rooms will provide guests with a wardrobe and a kettle. Liverpool ONE is 3 km from the accommodation, while Royal Court Theatre is 3 km from the property. The nearest airport is Liverpool John Lennon Airport, 12 km from the property. Featuring a shared lounge, Sidney Place is set in Liverpool. This property is situated a short distance from attractions such as Williamson's Tunnels. Free WiFi and a shared kitchen are offered. At the guest house, all rooms come with a wardrobe. Each room comes with a private bathroom with free toiletries and a hair dryer. Liverpool Metropolitan Cathedral is 1 km from Sidney Place. Liverpool John Lennon Airport is 12 km away. Situated in central Liverpool, the Signature Living Hotel features a bar and an exclusive function room. Situated in central Liverpool, the Signature Living Hotel features a bar and an exclusive function room. With a 24-hour concierge service and free Wi-Fi, the hotel is adjacent to Liverpool's lively Matthew Street. The bar serves array of delicious cocktails, spirits, and champagne. Offers on drinks are available to guests. Featuring 300 year old ceiling beams, this period building offers stylish rooms with an iPod docking station, a flat-screen LCD TV, and free movies. The en suite bathrooms have spa baths. Some rooms sleep up to 20 guests. The Signature Living Hotel is located directly opposite the Metquarter, which offers designer high-street stores. The LiverpoolONE shopping centre is within a 5-minute stroll. Liverpool Lime Street Station is just 5 minutes' walk away. Snooze is rated Trip Advisor's number one B&B in Liverpool by guest reviews. Located just 1.5 miles from the city centre Snooze Liverpool is the ideal choice for those who don't want their trip to cost the earth but who want cleanliness style and a friendly knowlegable staff. We'll help you make the best of your stay in Liverpool with pointers about where to go and what to do. All our rooms have powerful en-suite showers DVD/TV and either a luxurious Super King Size Bed or 2 twin beds. Soccer Suite is located in the Anfield district of Liverpool, 200 metres from Anfield Stadium. Soccer Suite is located in the Anfield district of Liverpool, 200 metres from Anfield Stadium. Complimentary WiFi is provided. A continental breakfast can be enjoyed at the property. Guests can also relax in the shared lounge area. Royal Court Theatre is 4 km from the bed and breakfast, while Liverpool Metropolitan Cathedral is 4.2 km away. The nearest airport is Liverpool John Lennon Airport, 17 km from the property. Situated 2 miles from Liverpool city centre, St Hilda Hotel offers free limited on-site parking and free Wi-Fi throughout. Each room at St Hilda offers a flat-screen TV. A communal kitchen can be accessed 24/7 and features tea/coffee making facilities. A microwave, washing machine and fridge/freezer are also provided. Guests can also relax in the lounge area which includes a dining table, small sofa and a flat-screen TV. The complimentary breakfast consists of cereals, toast and a selection of jams, marmalade and chocolate spread. The football grounds of Everton and Liverpool football clubs can be reached in just a 10-minute walk. Liverpool city centre offers a wide variety of shops, places to eat and nightlife. The Beatles Story attraction and Echo Arena are a 10-minute taxi ride away. Stadium Rooms Anfield offers rooms in Liverpool. The property is located 300 metres from Anfield Stadium and 2.8 km from Liverpool Metropolitan Cathedral. The property is 2.8 km from Williamson's Tunnels. Guest rooms in the guest house are fitted with a kettle. The shared bathroom is equipped with a hair dryer. Royal Court Theatre is 2.9 km from Stadium Rooms Anfield, while Casbah Coffee Club is 3 km from the property. The nearest airport is Liverpool John Lennon Airport, 12 km from the accommodation. Set within 700 metres of Royal Court Theatre and 700 metres of Liverpool Metropolitan Cathedral, Stafford Home Place provides rooms in Liverpool. This property is situated a short distance from attractions such as The Cavern Quarter, Williamson's Tunnels, and Philharmonic Hall. Western Approaches Museum is 1.4 km away and Liverpool ONE is 1.4 km from the guest house. All rooms in the guest house are fitted with a kettle. At Stafford Home Place, rooms include air conditioning and a flat-screen TV. Pier Head is 1.5 km from the accommodation. The nearest airport is Liverpool John Lennon Airport, 11 km from the property. 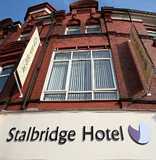 The Stalbridge is situated less than three miles from Liverpool John Lennon Airport, five miles from Liverpool City Centre and five minutes walk from Liverpool South Parkway train station. Brand New to Laterooms we are offering substantial discounts for a limited time!! !This property features Spacious Rooms with En-Suite Bathrooms. Stanley Park Hotel is located less than 2 miles from the River Mersey in the heart of the lively city of Liverpool. With a bar, a garden, and a terrace, it also has free on-site parking and free Wi-Fi in public areas. The rooms at Stanley Park Hotel each feature a TV and an en suite bathroom that includes a bath and a shower. In the morning, a buffet breakfast can be enjoyed by guests for an additional price. It is served in the spacious, brightly decorated dining room. The hotel is situated directly between both Goodison Park, home to Everton Football Club and also Anfield, home to Liverpool Football Club. Both are less than a mile away. The Cavern Club, a popular tourist attraction because of The Beatles, is a 9-minute drive away. Set in Liverpool, The Banjo Bed and Breakfast features accommodation 3.5 km from Anfield Stadium. Royal Court Theatre is 4.3 km from the bed and breakfast, while Western Approaches Museum is 4.4 km from the property. The nearest airport is Liverpool John Lennon Airport, 19 km from the property. Set in the village of Hale, 14.4 km from Liverpool city centre, The Barn Bed and Breakfast features free WiFi access and free private parking. Rooms have a flat-screen TV. Some rooms feature a seating area for your convenience. You will find a kettle in the room. The rooms have a private bathroom. For your comfort, you will find free toiletries and a hairdryer. Guests can enjoy a continental breakfast. ACC Liverpool is 14 km from The Barn Bed and Breakfast, while Liverpool Echo Arena is 14 km away. Liverpool John Lennon Airport is 3 km from the property. Situated in Liverpool, The Beauty Rooms BnB offers free WiFi, 2 km from Anfield Stadium. The accommodation has a sauna. The units have a fully equipped kitchen with an oven, kettle, and a microwave. There is a seating and a dining area in all units. A continental breakfast is available daily at the property. The bed and breakfast offers a barbecue. Guests can also relax in the shared lounge area. Royal Court Theatre is 3.8 km from The Beauty Rooms BnB, while Williamson's Tunnels is 4.2 km away. Liverpool John Lennon Airport is 18 km from the property. The Brook Guesthouse offers accommodation in Liverpool. Guests can enjoy the on-site bar. Each room includes a flat-screen TV. There is a shared bathroom. The Brook Guesthouse features free WiFi . The on-site coffee shop sells coffee, cakes, as well as fresh hot and cold snacks. Breakfast is served in the coffee shop, or in the rooms for an additional fee. You can play darts at the guest house. Anfield Stadium is 1.9 km from The Brook Guesthouse, while Royal Court Theatre is 3.8 km away. The nearest airport is Liverpool John Lennon Airport, 14 km from the property. The Cabbage Hall Hotel is 10 minutes' walk from Anfield stadium for Liverpool Football Club. All rooms have en-suite shower rooms and come with a 32 inch flat-screen TV. Other amenities include free tea/coffee, hair dryers and ironing facilities in all the rooms. The Cabbage Hall hotel also has a restaurant. Free WiFi is available in public areas. The Cabbage Hall also has a private function room available for special occasions, such as birthdays or christenings or a private space for meetings. The hotel is 20 minutes' walk to Goodison Park, home to Everton FC and for guests wanting a night out in Liverpool city centre. Cavern Club on Mathew Street for Beatles fans is just a 10-minute taxi ride away. Public transport to the city centre is also available near the hotel. Located just a 6-minute drive from Albert Dock in central Liverpool, The Georgian Town House Hotel offers free WiFi access and free parking. Located just a 6-minute drive from Albert Dock in central Liverpool, The Georgian Town House Hotel offers free WiFi access and free parking. Less than 2 miles from Echo Arena Liverpool and Tate Liverpool, Liverpool Central Train Station is also 18 minutes' stroll away. Each room at the hotel includes a TV and a small fridge. Featuring a shower, the private bathroom also comes with a hairdryer. Extras include a desk, bed linen and ironing facilities. At The Georgian Town House Hotel there is a 24-hour front desk and a garden. Other facilities offered at the property include luggage storage. The hotel is 1.3 miles from the Cavern Quarter and the Playhouse Theatre. The World Museum, Central Library and Walker Art Gallery are all just 27 minutes' walk away. The Glebe Hotel is situated in the centre of Walton, 4.6 km from Liverpool city centre. Originally built around 1882, The Glebe was is a Grade II listed building due to its architectural importance, Gothic style and spire. Featuring many of it's original features, the rooms are equipped with a desk, a flat-screen TV and a private bathroom. A continental breakfast is delivered to guest rooms every morning. The hotel is within 1 km from Goodison Park and the historic Stanley park, which will take guests directly to Anfield Stadium, 2.3 km away and the home of Liverpool Football Club. Aintree Racecourse is 4 km away from the property. Situated in Liverpool within 700 metres of Anfield Stadium and 3.4 km of Royal Court Theatre, The Glenbuck Hotel Anfield offers rooms with free WiFi. The property is located 3.7 km from Williamson's Tunnels. Attractions in the area include Western Approaches Museum, 3.8 km away, or Liverpool Metropolitan Cathedral, set 3.9 km from the property. All units in the hotel are equipped with a flat-screen TV. All rooms include a shared bathroom. A continental breakfast can be enjoyed at the property. Pier Head is 4.1 km from The Glenbuck Hotel Anfield, while The Cavern Quarter is 4.2 km from the property. The nearest airport is Liverpool John Lennon Airport, 17 km from the property. The Green House features accommodation with a garden and free WiFi. All units comprise a seating area, and a fully equipped kitchen with various cooking facilities, including an oven, a toaster, a fridge and a stovetop. There is a shared bathroom with bath in all units, along with free toiletries and a hair dryer. A continental breakfast is served daily at the property. Sefton Park is 1.7 km from the bed and breakfast, while Philharmonic Hall is 2.4 km from the property. Liverpool John Lennon Airport is 11 km away. A luxurious 5-star bespoke boat designed around the theme of Joker from Batman, this barge is situated in Liverpool's boating marina, with its own bar and grill. A luxurious 5-star bespoke boat designed around the theme of Joker from Batman, this barge is situated in Liverpool's boating marina, with its own bar and grill. The Joker Boat is contemporary in style, with sleek purple furnishings and elegant d�cor. The fully-equipped Italian kitchen boasts a gas oven and cooker, a microwave, a fridge, a washing machine and a dryer. There is seating space and a TV with Sky channels. The city's main attractions, including Mathew Street and Liverpool One shopping centre, are less than 10 minutes away on foot. Liverpool John Lennon Airport is 18 minutes' drive away and Manchester International Airport is 36 miles from the property; a luxury pick-up service in a Rolls Phantom or a H2 Hummer is available from these airports at a surcharge. Situated 1.1 km from Philharmonic Hall and featuring free WiFi, The Liverpool Central Rooms features accommodation in Liverpool. A continental breakfast is available each morning at the property. The aparthotel offers a terrace. Liverpool Metropolitan Cathedral is 1.1 km from The Liverpool Central Rooms, while Liverpool ONE is 1.5 km away. The nearest airport is Liverpool John Lennon Airport, 13 km from the accommodation. Located in Liverpool, 2.3 km from Anfield Stadium and 2.3 km from Williamson's Tunnels, The Liverpool Reds B&B features accommodation with free WiFi. Guests can also relax in the shared lounge area. Liverpool Metropolitan Cathedral is 2.6 km from the bed and breakfast. The nearest airport is Liverpool John Lennon Airport, 14 km from the property. Offering a terrace, The Luxe Stay is set in Liverpool, not far from M&S Bank Arena Liverpool and Liverpool Echo Arena. Complimentary WiFi is provided. The accommodation comes with a flat-screen TV and a private bathroom with bath and free toiletries, while the kitchen has a dishwasher, an oven and a toaster. There is a seating and a dining area in all units. ACC Liverpool is 400 metres from the aparthotel. The nearest airport is Liverpool John Lennon Airport, 13 km from The Luxe Stay. The Prince Alfred is set in Liverpool, 2.8 km from Liverpool Football Club. Guests can enjoy the on-site bar. The Prince Alfred features free WiFi throughout the property. Anfield Stadium is 2.9 km from The Prince Alfred, while Royal Court Theatre is 6 km away. Liverpool John Lennon Airport is 15 km from the property. All rooms at The Racquet Club are individually designed with Roll-top baths or walk in shower. You could be staying in the Japanese room or in an antique French bed. The Racquet Club is also the home of our award winning restaurant Ziba. This chic hotel has a 2 squash courts and an award-winning restaurant. Liverpool city centre is 10 minutes' walk and Echo Arena is a 5-minute drive away. Ziba Restaurant offers a modern English menu and there is an intimate bar with free Wi-Fi. The individual rooms at The Racquet have antiques and local artwork, Freeview TV and either a walk-in shower or roll-top bath. The Racquet hotel offers modern apartments with open plan living/dining areas. Boasting a bar, The Valley Guesthouse is set in Liverpool, 1.1 km from Anfield Stadium. Around 3 km from Royal Court Theatre, the property is also 3.3 km away from Williamson's Tunnels and offers free WiFi. The property is 3.5 km from Western Approaches Museum. The units at the guest house are equipped with a flat-screen TV and a kitchenette. All units feature a wardrobe. Liverpool Metropolitan Cathedral is 3.5 km from The Valley Guesthouse, while Pier Head is 3.7 km away. The nearest airport is Liverpool John Lennon Airport, 16 km from the property. Situated in the Liverpool City Centre of Liverpool, The Vines (The Big House) is less than 1 km from Liverpool Metropolitan Cathedral. Featuring a bar, the property is located within a 13-minute walk of Philharmonic Hall. The property is close to popular attractions like Liverpool ONE, Albert Dock and Royal Court Theatre. Royal Court Theatre is 1.8 km from the hotel, while Pier Head is 2.1 km away. The nearest airport is Liverpool John Lennon Airport, 13 km from the property. The Watford House is situated in Liverpool, 100 metres from Anfield Stadium. The property is around 3 km from Royal Court Theatre and 3.7 km from Pier Head. The property is 3.8 km from Liverpool ONE. Guest rooms in the guest house are fitted with a kettle. Albert Dock is 4 km from The Watford House. Liverpool John Lennon Airport is 12 km from the property. When you stay at Titanic Hotel Liverpool in Liverpool, you'll be on the waterfront and minutes from Stanley Dock Tobacco Warehouse and Awesome Walls Climbing Centre. Located in Liverpool Marina with an on-site bar and grill, this apartment boat has been designed to resemble the Titanic. Guests at Titanic Boat can enjoy a 52-inch TV with Sky channels. The lounge area has traditional d�cor and leather sofas, and there is also a fully equipped kitchen with an oven, a fridge, a microwave, a stove, and a washing machine and dryer. Liverpool One shopping centre is a 12-minute walk from the property and Matthew Street is a 15-minute walk away. Situated on The Wirral, a 5-minute drive from the centre of Birkenhead, this hotel offers free Wi-Fi and free parking on site. Mersey Park is half a mile away, and Chester Racecourse can be reached in 30 minutes by car. Rooms at Villa Venezia have simple, traditional d�cor, and benefit from a flat-screen TV and tea and coffee making facilities. Each also has a work desk and an en suite bathroom. A cooked breakfast is available at this property for an additional cost. The restaurant serves a tasty menu with food made from local ingredients, and there are plenty of vegetarian options. Guests can enjoy a 10% discount in the restaurant. The Mersey Tunnel to Liverpool is 2 miles away, and there is easy access to the M62 for getting to Manchester. Liverpool's Echo Arena is only a 15-minute drive away. Wavertree Rooms Liverpool is a guesthouse with a shared lounge, situated in Liverpool, 1.9 km from Sefton Park, 3.2 km from Philharmonic Hall, as well as 3.3 km from Liverpool Metropolitan Cathedral. Set in Liverpool, We are Liverpool g/house is 200 metres from Anfield Stadium. Around 4 km from Williamson's Tunnels, the property is also 4 km away from Casbah Coffee Club and offers free WiFi. The property is 4.2 km from Royal Court Theatre and 4.3 km from Liverpool Metropolitan Cathedral. Western Approaches Museum is 5 km from the guest house. The nearest airport is Liverpool John Lennon Airport, 16 km from the property. Providing free WiFi, Woodlands Guest House offers accommodation in Liverpool, 8 km from Anfield Stadium. The property is around 9 km from Western Approaches Museum, 9 km from Pier Head and 9 km from Liver Building. Royal Court Theatre is 9 km from the property. A Full English/Irish breakfast is served each morning at the property. The Cavern Quarter is 9 km from the guest house. The nearest airport is Liverpool John Lennon Airport, 23 km from Woodlands Guest House. Situated in Liverpool, in a building dating from 19th century, 1.6 km from Anfield Stadium, liverpool party pad offers guestrooms with free WiFi. Located around 3.5 km from Royal Court Theatre, the guest house is also 3.8 km away from Williamson's Tunnels. The property is 3.9 km from Western Approaches Museum and 4.1 km from Liverpool Metropolitan Cathedral. Pier Head is 4.2 km from the guest house. Liverpool John Lennon Airport is 17 km away.